French toast for breakfast immediately makes your day more special. This is the best way to make sandwich with butter and jelly / jam. This is the best breakfast, very simple and healthy too. Breakfast word itself means break-fast, break means meals and fast means whatever we made, it will be make fast or Jhatpat recipe but of course it would be healthy also. This is my all time favorite breakfast recipe, tasty and easy to make. I hope you'll all like it..
1. Take Brown bread or any of your choice bread, toast it on tawa without butter on both the sides till golden brown. 2. Take toasted bread, spread one side butter and one side Jam / jelly and combine both the toasted bread together. 3. 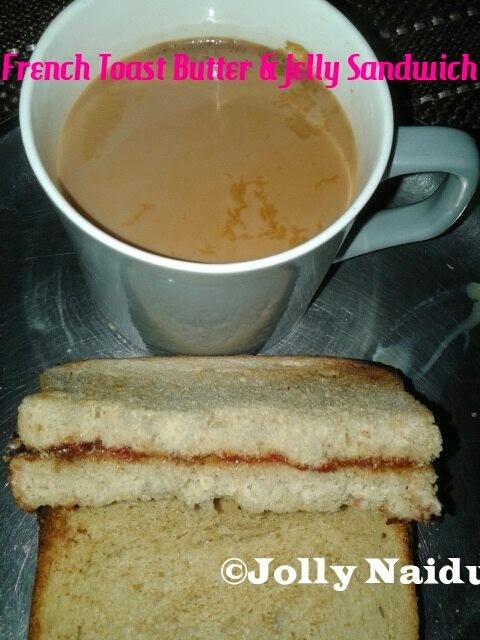 Your Yummy French Toast Butter and Jelly Sandwich is ready, you can serve with tea and coffee. Special Tip : You can also use Peanut butter also instead of Salted Butter. Peanut butter is also a good combination with Jam.